Vocaloid 4 is a singing voice synthesizer and successor to Vocaloid 3 in the Vocaloid series. In October 2014, the first Vocaloid confirmed for the Vocaloid 4 engine was the English vocal Ruby, its release was delayed so it could be released on the newer engine. A Vocaloid 4 version for OS X has also been released. All AH-Software vocals were also announced as receiving updated packages as well as VY1v4. The update of the AH-Software Vocaloid 2 vocals is related to Windows 10 being released in 2015, and the impact it may have on the Vocaloid 2 software. The Vocaloid 4 engine allows the importing of Vocaloid 2 and Vocaloid 3 vocals, though Vocaloid 2 vocals must have already been imported into Vocaloid 3 for this to work. The new engine includes other features, but not all of them are accessible by Vocaloid 2 and Vocaloid 3 vocals. One of the new features is a "Growl" feature which allows vocals built for Vocaloid 4 to take on a growl-like property in their singing results. Cross-synthesis was also added, allowing the user to switch between two of a character's vocals built for the same language smoothly using a time-varying parameter. This feature is accessible when using Vocaloid 3 and Vocaloid 4 vocals, but not Vocaloid 2. Cross-synthesis only works with vocals from the same character, making use with packages like VY1v4 possible, but not packages such as Anon and Kanon. Another feature included is Pitch Rendering, which all imported vocals can use. This displays the effective pitch curve on the user interface. Finally, real-time input has been included in this version and is another feature which all vocals can use. VSQX files made for Vocaloid 3 work in Vocaloid 4, but they will not work the other way around. For Japanese users who had bought Vocaloid 3, Vocaloid 3 Editor, Vocaloid Editor for Cubase or VY1v3, Yamaha offered a free upgrade for each software. Those who bought the editor after November 10, 2014 were also offered a free upgrade until June 2015. Those who wished to use Vocaloid on a Mac, however were offered only the Vocaloid Editor for Cubase as an option for use of the Vocaloid editor on Mac as a normal Vocaloid 4 adaption was not offered. One of the highlights of the Cross-synthesis function is that it can produce very different results depending on which vocals are mixed. Megpoid V4's two vocals "Native" and "NativeFat" will not produce much difference between them. However, by mixing Megpoid V4 vocals "Power" and "Sweet" the function will produce a very different result. When it was first released, it was only available in Japanese or English, despite being fully capable of using Chinese, Korean, or Spanish vocals from Vocaloid 3. This was similar to how with the original Vocaloid software functioned, in that its interface was only in English, despite having vocals for other languages. Despite the release of Vocaloid 4, Chinese vocals Yuezheng Ling and Zhanyin Lorra were also developed as releases intended for Vocaloid 3. As of the voice "Cyber Diva", some long term bugs were fixed and pronunciations addressed. English Vocaloid libraries now use a new shorter, more effective script. A custom library was made for the vocal, the largest ever made, which caused an issue with the dictionary proxy that was addressed. English vocals now have more clarity, at the price of expressive tones. Due to the mislabeling of certain phonetic symbols, all past English built vocals were reported to have incorrect sounds assigned to certain symbols, this has been addressed with the new script. Several adaptations of the Vocaloid 4 have been released. Namely, A Mobile version of the editor was released in 2015. Another adaption of the software came in the form of "Unity with Vocaloid", a version of the engine which allowed it to synthesis vocals in real-time within the Unity Engine. The job plug-in "Vocalistener" also received an upgrade, with an upgrade offer for Vocaloid 3 version owners offered. Vocaloid 4 was the last version released under Hideki Kenmochi, as he announced his retirement on January 30, 2015. Vocaloid has continued its development. He was replaced by Katsumi Ishikawa. In addition to the Vocaloid 4, the software itself also saw use in the Vocaloid Keyboard, which had first been announced in 2012, though prototypes of the Keyboard were finally unveiled in mid-2015 though did not see commercial release. The latest version of the VY1 product, VY1v4 contains 4 voices, "Natural", "Normal", "Power" and "Soft." VY1v4 was released on December 17, 2014, for both PC and Mac operating systems. Those who bought the previous version were offered an upgrade discount which was included on the Vocaloid shop. 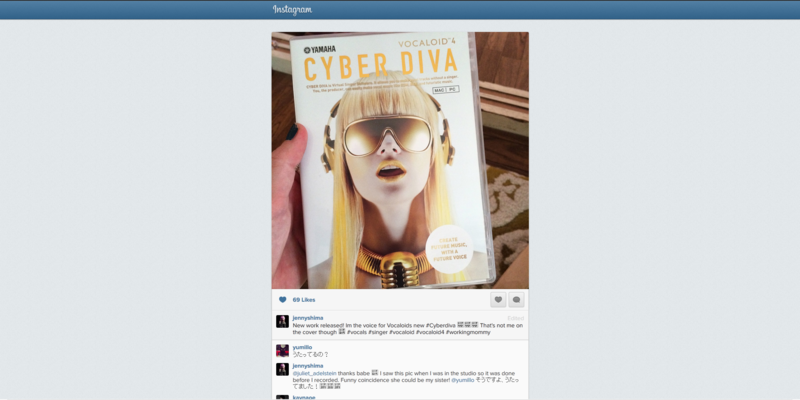 Cyber Diva is an American Accented Female vocal released on February 4, 2015. The voice provider is Jenny Shima, who is an American singer, theater actress, and model. A version of this vocal was also added to the Mobile Vocaloid Editor app, making it the first English vocal for the app at the time of release, and for a quite a while the only vocal on the English app. Despite this, the app was still using a Japanese interface at the time of release. An update on the Vocaloid 3 product "Yuzuki Yukari", this update, released March 18, 2015, contains three vocals, "Jun", "Onn" and "Lin". "Jun" being a faithful recreation of her previous vocal, "Onn" being a soft type vocal, and "Lin" being a power type vocal. The vocals can be purchased individually or as a complete package. In addition, it was announced that all 3 vocals were would be released for the "Unity with Vocaloid" version. All 3 vocals also appeared on the Mobile Vocaloid Editor app, each sold separately. Yuzuki Yukari also later would have her voice developed into the Vocaloid Keyboard. An update on the Vocaloid 2 product "Megurine Luka" that was released March 19, 2015, on both PC and Mac. She comes with four Japanese vocals, "Soft" and "Hard", as well as E.V.E.C. [expand acronym], plus two English vocals, "Straight" and "Soft". The "E.V.E.C." system adds options to change the tones of the Japanese vocals "Soft_EVEC" and "Hard_EVEC" to 9 additional Japanese tones: "Power 1", "Power 2", "Native", "Whisper", "Dark", "Husky", "Soft", "Falsetto" and "Cute." "SOFT_EVEC" and "Hard EVEC" can be used for Cross-synth, giving Luka four possible XSY (cross-synthesis) vocals for Japanese, and two for English. The vocal is based on breath. An update of the V3 Gackpoid product announced on March 31, 2015, and released on April 30, 2015. An update on the Vocaloid 2 product. The voice comes with two libraries: "Natural" and "soft". Released June 18, 2015. An update on the VOCALOID2 product. Released June 18, 2015. An update of the V flower vocal released for Vocaloid 3. Released on July 16, 2015. Those who bought the previous version were offered an upgrade discount, which was included on the Vocaloid shop. Sachiko is a Japanese female Vocaloid from Yamaha, released on July 27, 2015. The voice actor is the Enka singer Sachiko Kobayashi. She came with a special plug-in for Vocaloid 4 called "Sachikobushi." This adjusts VSQx files to make her sing like her provider. This vocal was later also added to the Mobile Vocaloid editor app. ARSloid was announced in June 2015, and released on September 23, 2015. He is a male vocal based on the singer Akira Kano from Arsmagna. Product comes with three vocals, "Original", "Soft" and "Bright," allowing cross synthesis to be used. An American female English vocal developed by independent developer "Prince Syo" in collaboration with Anders of VOCATONE and distributed by PowerFX Systems AB. was released on October 7, 2015. A Japanese voicebank was also conceived but cancelled, however it may be considered if the English Voicebank sells well. An update on the Vocaloid 2 product released on October 29, 2015. Due to the original voice actor maturing, a new actor was used for this product to make the new samples needed to complete the vocal library. An update on the Vocaloid 2 product, includes the "Natural" and "rock" Voicebanks that was released on October 29, 2015. The update to the Megpoid software. There are a total of 10 vocals for this package, the first five, Native, Adult, Whisper, Sweet, and Power are updates on the old Vocaloid3 versions. The last 5 are new vocals and consist of Nativefat, MellowAdult, PowerFat, NaturalSweet, and SoftWhisper. Megpoid V4 was released as "complete package" with all ten vocals, or as one of five separate packages with a pair of vocals in each. Native; containing the vocals "Native" and "NativeFat"
Adult; containing the vocals "Adult" and "MellowAdult"
Power; containing the vocals "power" and "PowerFat"
Sweet; containing the vocals "Sweet" and "NaturalSweet"
Soft; containing the vocals "soft" and "SoftWhisper"
The vocals supplied in each package are especially designed to be Cross-Synthesis friendly, producing the best results such as "Native" and "NativeFat". However, vocals used with one package when used with the function with vocals from another package produce a very different result. So mixing "Power" and "Sweet" will be almost the equivalent of another vocal library entirely. Released on November 5, 2015. The voice was also featured in use on the Vocaloid Keyboard prototype. Megpoid English is also currently in consideration for an update. Development currently unscheduled but estimated to begin in 2016 or 2017. Dex is a male American accented Vocaloid by Zero-G, and partner to Daina, based on a hound theme and pop-orientation. Dex was released on November 20, 2015. Dex was also sold for the Mac version of the software, a first for Zero-G Vocaloid software. Daina is a female American accented Vocaloid by Zero-G and the partner vocal to Dex. She is based on a fox theme and is pop-orientated. Released on November 20, 2015. Daina was also sold alongside Dex for the Mac version of the software, a first for Zero-G Vocaloid software. Rana was also announced for an upgrade at "The Voc@loid M@ster 33" event. The first 100 visitors to the "Rana Experience" booth were given the chance to obtain Rana V4 early access. Her Vocaloid4 version was released on the 1 December 2015. This voice is identical to the Vocaloid3 version, except for the addition of a growl function. Those who had registered all 30 issues in the magazine Vocalo-P ni Naritai (ボカロＰになりたい！) version were offered an upgrade discount on the Vocaloid shop. An update on the Vocaloid 2 product "Kagamine Rin/Len" was released in Q3, 2015 for both PC and Mac. The vocals are based on tension and strength while being able to control power. They also both come with an English Voicebank On August 31, 2015, their homepage was launched, confirming their "V4X" status and their use of E.V.E.C. The package contains updates on the original Vocaloid2 Append vocals ("Power", "Warm" and "Sweet" for Rin and "Power", "Cold and "Serious for Len), with improvements. E.V.E.C. is only possible with their "Power" vocals, in comparison to the past Luka package, only options "Soft" and "Power" are given. In addition to the main package a separate English vocal package wads produced for Kagamine Rin and Len. The package contains natural sounding vocals for creation of English. They are currently being sold as an expansion pack and are sold bundled with the Kagamine Rin/Len V4X package, or on their own with only the lite version of the Vocaloid4 engine. There have been many comments on the close similarities between Luka's English vocals and Len's English vocals. Both Rin and Len's English vocals are softer and less defined than their Japanese sounds. The release date was 24 December 2015. The Unity-Chan is a feminine Japanese vocal voiced by Japanese novice voice actress Kakumoto Asuka. Unlike previous software, it has two mascots for the single vocal, Kohaku and AKAZA. They were released on the 14 January 2016 for the Unity Engine version of the software "Unity with Vocaloid". A special version of the package called "『C89特別仕様 『VOCALOID4 Library unity-chan!』PROJECT:AKAZA スペシャルパッケージ』" was sold at the COMIKET 89 booth. They will also be released for the Mobile Vocaloid Editor. They have a special licensing. For use of their vocal within projects, the voice will be provided for free as long as a 10 million yen is the consultation fee is paid. For other public uses of the vocal, a Vocaloid engine fee is required. Due to the Yamaha royalty system, users will have to seek consultation with 3rd parties for use with Vocaloid and other companies vocals. Is a Japanese; English male Vocaloid whose voice was provided by Satoshi Fukase (深瀬 慧, Fukase Satoshi). He was released on January 28, 2016 with 3 vocals: "Normal", "Soft", and "English". This package also comes with a plug-in for Vocaloid 4 called "Electric Tune" which allows the user to add distinct pitching effects to the voice, such as a robotic sound. It also includes a booklet with information about how to operate the VOCALOID4 editor and Fukase's vocal using SEKAI NO OWARI's song "Starlight Paradise". Fukase's license agreement requires permission before it may be used in commercial products. Xingchen (星尘), known under the English name "Stardust", is a female Chinese vocal released on April 13, 2016. She was developed by Shanghai HENIAN, voiced by Chalili, and her character was conceptualized as "Quadimensionko", a mascot for the Quadimension album series and group. A Japanese Vocaloid voiced by the Japanese voice actress Aimi Tanaka. She comes with a "sweet" type vocal called "SUGAR" and a "powerful" type called "SPICY". On August 31, 2015 the title of her update was revealed. She was released August 31, 2016, 9 years after her original Vocaloid 2 release. Like Megurine Luka V4X and Kagamine Rin/Len V4X, she has E.V.E.C. capabilities. She has seven voice-banks "Original," "Solid," "Dark," "Soft," "Sweet," "English," and "Chinese." "Original," "Solid," and "Soft" contain the E.V.E.C. colors and Power~Soft. The English voice-bank is meant to resemble a mixture of the retired append, "vivid", and "Original". As such, it sounds drastically different than the previous English vocal. It can be purchased in a bundle, or as a separate purchase similar to her V3 release and Kagamine Rin/Len V4X. Uni is a Korean Vocaloid created by ST MEDiA that was released in February 2017. She has two expansion vocals in development, "Power" and "Soft". An English package is planned after the completion of these expansions. A Chinese Mandarin male vocal released May 10, 2017. He is voiced by the Chinese voice actor, Zhang Jie. Tianyi's update production was officially announced on March 12, 2015, and released on July 15, 2016. In her V4 version, she received a complete re-record of her previous lines, and one additional line. Development on a Japanese voicebank for Luo Tianyi was confirmed to have been restarted on June 19, 2017. It was released on May 18, 2018. A complementary male vocal for Cyber Diva, released in October 2016. A VOCALOID4 update for Tohoku Zunko was released on October 27, 2016. An update to Macne Nana Japanese and English was released December 15, 2016, along with a new VOCALOID, Macne Petit. Like Macne Nana, Macne Petit was ported to VOCALOID following her performance on other platforms. An update to VOCALOID3 vocal Tone Rion was released February 16, 2017. She is voiced by Nemu Yumemi, who also voices associated VOCALOID Yumemi Nemu. A complementary feminine vocal to Tone Rion was released February 16, 2017. Yumemi Nemu's voice provider and namesake is Nemu Yumemi of Dempagumi.inc. A new VOCALOID by the upcoming company, Akatsuki Virtual Artists, named LUMi was released on August 30, 2017. An update to VOCALOID3 Xin Hua was released on September 1, 2017, with a Japanese Vocal being released on September 22, 2017. A Japanese VOICEROID2 and VOCALOID produced by VOCALOMAKETS, part of AH-Software. The VOCALOID package was released on April 26, 2018. A new VOCALOID named Mirai Komachi by the company Bandai Namco Studio Inc was released on May 24, 2018. A Mandarin Chinese VOCALOID developed by Vsinger. He is voiced by Shangqing Su. The vocal was demonstrated live on June 17, 2017, and was later released alongside Mo Qingxian on August 2, 2018. His design was originally unveiled in 2012, following an official contest. A Mandarin Chinese VOCALOID developed by Vsinger. She is voiced by Mingyue. The vocal was demonstrated live on June 17, 2017, and was later released alongside Zhiyu Moke on August 2, 2018. Her design was originally unveiled in 2012, following an official contest. In 2015, Zero-G reported that Dex and Daina achieved high download numbers. Crypton Future Media's download website "Sonicwire" reported that the Megurine Luka V4X product had the number 1 position in Vocaloid sales. This would later be overtaken by the Hatsune Miku V4X Bundle. ^ a b c Fujimoto, Ken (November 24, 2014). "VOCALOID4への各社の対応とクリプトンの新技術E.V.E.C." [VOCALOID4 measures of each vendors, and Crypton's new technology, E.V.E.C.]. Ken Fujimoto's DTM Station (in Japanese). Retrieved November 27, 2014. ^ "VOCALOID4 クロスシンセシス可能グループ一覧" [VOCALOID4 cross synthesis available group list] (table) (in Japanese). Yamaha Corporation. 2014. Retrieved 22 December 2014. ^ "Yamaha Announces VOCALOID4". Vocaloidism. November 20, 2014. Retrieved November 23, 2014. ^ a b "10ライブラリが勢ぞろいしたVOCALOID4版、Megpoidが登場". 藤本健の“DTMステーション”. ^ a b "Yamaha VOCALOID™ Singing Voice Synthesis Technology Now Offers Realistic Vocal Library in American English". PRWeb. January 21, 2015. Retrieved January 21, 2015. ^ "iPad/iPhoneで本格ボカロ制作できる「Mobile VOCALOID Editor」。PC版とほぼ同等" [Authentic iPad / iPhone "Mobile VOCALOID Editor" Vocaloid production now possible. Almost the same as the PC version]. AV Watch (in Japanese). 3 April 2015. Retrieved 14 October 2015. ^ ヤマハ株式会社. "Unity with VOCALOID". VOCALOID™. ^ "ゲームエンジン「Unity」に「VOCALOID」が対応。12月にUnity向け統合開発環境と「ユニティちゃん」歌声ライブラリを公開予定 - ニュースリリース - ヤマハ株式会社". Archived from the original on 2015-08-26. Retrieved 2015-08-25. ^ "VOCALOIDの生みの親であるヤマハの剣持さんがVOCALOIDプロジェクトから離れる件" [Yamaha's Vocaloid creator, Hideki Kenmochi, is leaving the Vocaloid development project]. MikuStream (in Japanese). 30 January 2015. Retrieved 14 October 2015. ^ "【CEDEC 2015】"VOCALOID for Unity"がもたらす可能性とは？ セッションレポート". GameBusiness.jp. ^ ヤマハ株式会社. "【終了】VOCALOID™ KEYBOARDを目撃しよう！～ヤマハ、ヤマハ発動機 合同デザインイベント開催". ^ "New VOCALOID™ V4 "CYBER DIVA" - VocaloidOtaku.net Forums - Providing Everything Vocaloid - Page 46". ^ "結月ゆかり誕生祭2015生放送　告知内容まとめ - VOCALOMAKETS blog". ^ "巡音ルカV4X紹介 第2回：「VoiceColor」の種類追加のお知らせ" [Megurine Luka V4X Introduction Part 2: Additional "VoiceColor" vocal types]. SONICWIRE Blog (in Japanese). Crypton Future Media. 9 January 2015. Retrieved 14 October 2015. ^ a b Crypton Future Media [@vocaloid_cv_cfm] (26 December 2014). "【リンレンV4Xについて】ルカV4Xは、かなり「息の成分」に凝った仕様になりってますが、リンレンはやはり「力強さ／声の張り」のバリエーションが重要になりそうです。ただ力強いだけなく、力強さに行く前の"タメ"が出来るようになればいいなと考えています。" (Tweet) (in Japanese). Retrieved 14 October 2015 – via Twitter. ^ "日本を代表するアーティスト「GACKT」の声をベースに制作した、VOCALOID4専用歌声ライブラリ。" [Voice of artist "GACKT" is to be recorded as a VOCALOID4 dedicated voice library.] (in Japanese). INTERNET Co. 31 March 2015. Retrieved 14 October 2015. ^ Gynoid Co. [@v_flower_jp] (23 April 2015). "【お知らせ】ボーカロイド「v flower(ブイフラワ)」今夏「V4化」決定! 製品名は「v4 flower(ブイフォウ フラワ)" (Tweet) (in Japanese). Retrieved 14 October 2015 – via Twitter. ^ "VOCALOID4 Library Sachiko" (in Japanese). Yamaha Corporation. Retrieved 14 October 2015. ^ "アルスマグナのVOCALOID歌声ライブラリ「アルスロイド」発売中！" [Launch of the VOCALOID voice library "Arsloid" from Ars Magna!] (in Japanese). Yamaha Corporation. Retrieved 14 October 2015. ^ "さらなる表現力を携えたあらゆるジャンルを歌いあげるバーチャルボーカリスト。" [Virtual vocalist software Megpoid getting a new expressive update] (in Japanese). Internet Co. 7 October 2015. Retrieved 17 October 2015. ^ "New Zero-G Vocaloid 4 "Dex" and "Daina" Revealed in Live Stream & Convention Panel". Engloids. June 20, 2015. Retrieved October 14, 2015. ^ ヤマハ株式会社. "【祝★Rana誕生1周年】「VOCALOID4 Library Rana」発売中！". ^ ヤマハ株式会社. "Rana V4 アップグレード版". ^ "鏡音リン・レン V4X" [Kagamine Rin/Len V4X] (in Japanese). Crypton Future Media. 31 August 2015. Retrieved 14 October 2015. ^ "『VOCALOID for Unity』発表！しかもユニティちゃんのボイスデータも提供されるぞ〜！" ["VOCALOID for Unity" announcement! Moreover, voice data has been provided for Unity-chan!]. Unity Technologies Japan (in Japanese). 26 August 2015. Retrieved 14 October 2015. ^ Aetas Inc. "ゲームから歌声をリアルタイムに変化させる「VOCALOID for Unity」改め「Unity with VOCALOID」のリリース日は12月21日に決定。「VOCALOID for Unity プロジェクトアップデート」聴講レポート". 4Gamer.net. ^ "【大賞決定】SEKAI NO OWARI、Fukaseがボカロ化！キャラクターデザインをpixivで募集" [[Grand Prize Decision] SEKAI NO OWARI, Fukase will be a Vocaloid! We are looking for a character design in pixiv] (in Japanese). Yamaha Corporation. 18 September 2015. Retrieved 14 October 2015. ^ ヤマハ株式会社. "SEKAI NO OWARI Fukaseのボーカロイド『VOCALOID4 Library Fukase』発売中！". ^ "VOCALOID４ Library Fukase". VOCALOID４ Library Fukase. ^ Vsinger (28 May 2015). "【统一回复】鉴于有海量的反馈是"为什么还...来自Vsinger". Weibo (in Chinese). Retrieved 14 October 2015. ^ "クリプトン：「初音ミクV4X」は2016年上半期、「鏡音リンレンV4X」は2015年12月リリース予定" [Crypton: "Hatsune Miku V4X" will be released in first half of 2016, "Kagamine Rin/Len V4X" will be released in December 2015]. 初音ミクちゃんねる (Hatsune Miku Channel) (in Japanese). 31 August 2015. Retrieved 14 October 2015. ^ Vsinger (30 July 2015). "#V家动态# 乐正龙牙的声库企划已于内部立项... 来自Vsinger". Weibo (in Chinese). Retrieved 17 October 2015. ^ Vsinger (2 October 2015). "#V家动态# 2015年10月2日，我看到了满天炸裂的烟花". Weibo (in Chinese). Retrieved 17 November 2015. ^ "Sina Visitor System". weibo.com. Retrieved 2016-12-18. ^ "Zero-G Top 50 Best Selling Sample Libraries of 2015". This page was last edited on 29 March 2019, at 21:44 (UTC).